Titanium production began more than two centuries ago, when scientists first synthesized raw ore into shiny, lustrous metal. In 1910, titanium tetrachloride was reacted with molten sodium to prepare the first pure titanium metal for the world, by the Hunter process. In 1946, the process was commercialized by reducing titanium tetrachloride with magnesium, by the Kroll process. 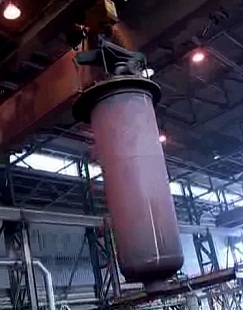 This is the process that is used today in most of modern titanium plants. An integrated processor usually produces titanium tetrachloride, elemental titanium sponge and melted ingot. The titanium production inside a manufacturing plant typically has four main processes: the chlorination and purification process, magnesium electro wining, commonly referred to as magnesium recovery process, titanium sponge production, using the vacuum distillation process and the vacuum arc re-melting ingot production process. The main mineral ores used to obtain titanium metal are rutile and ilmenite. Rutile is about 95% titanium dioxide, or 60% by weight of titanium. Ilmenite is much less pure, at about 35% titanium. Obviously, the most used ore in titanium production is rutile. Oxygen combines with carbon in the coke to produce carbon monoxide and carbon dioxide. The titanium and chlorine react to form a gaseous titanium tetrachloride. The crude titanium tetrachloride is then processed to a series of condenser and purification towers until it reaches purity close to 100%. The liquid titanium tetrachloride is then stored in special tanks filled with helium. Helium acts as an inert cover gas to prevent the exposure of titanium tetrachloride to moisture. The reduction process is performed under argon gas to prevent the introduction of air into the vessel. After four days of reduction the vessel is hot polled to minimize the heat loss and transferred to a distillation furnace. During the distillation process, a vacuum is created inside the hot vessel, which draws of any unreacted magnesium together with the magnesium chloride byproduct. After another four days of distillation the vessels are once again flooded with argon gas to prevent the introduction of air and hot polled to a cooling area. The titanium produced from this distillation process has a fibrous, sponge-like appearance and is therefore referred to as titanium sponge. The content of one vessel is referred to as “a mass” or “a batch”. One the vessel has cooled, the sponge mass, typically weighing 18000 to 20000 pounds, is pushed out of the vessel and transported to a shearing area. Each mass is sheared and crushed to particle size of less than one half inch. 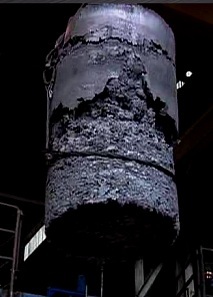 A beam like electrode is fabricated from compacted sponge, with possibly scrap titanium addition which is loaded into a re-melting furnace. Two major mechanical assemblies combine to form the vacuum vessel in which melting occurs - the movable furnace head and the fixed melt station. The movable furnace head is the upper section of the vessel. An integral ram assembly connected to a highly sophisticated servo drive supports and controls the movement of the electrode. The water-cooled ram extends through a vacuum seal in the head and the electrode clamps to its lower extremity thus becoming the cathode of the arc melting operation. The fixed melt station, which forms the lower half of the vacuum vessel, consists of a removable copper crucible that is placed into a fixed stainless steel water jacket. Once the electrode is clamped to the ram assembly the ram lifts the electrode while furnace head is lowered to create a vacuum seal on top of the crucible. Once a vacuum is established, the DC power supply is activated and the control system automatically strikes a high current arc between the consumable electrode (cathode -) and the crucible base (anode +) which quickly forms a molten pool of metal. The gap between the melting electrode and metal pool (arc gap) is precisely maintained and a controlled melt rate is established. The metal droplets falling through the arc gap are exposed to the vacuum environment and the extreme temperatures of the arc zone.